The Dy. C.E.O, KVIC, Shri K.S. Rao launching an Exhibition showcasing green stationery items of handmade paper, on the occasion of World Environment Day in New Delhi on June 05, 2015. 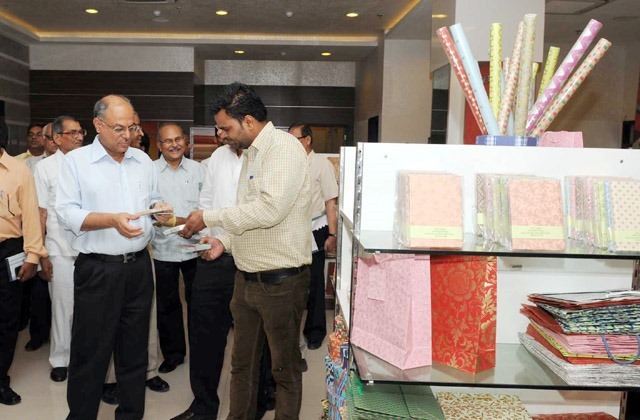 The Khadi Gramodyog Bhavan, KVIC under the Ministry of Micro, Small and Medium Enterprises launched a five day long Exhibition showcasing green stationery items of handmade paper to commemorate the World Environment Day! Speaking on the occasion Shri K.S. Rao, Dy. C.E.O, KVIC informed the media that Handmade Paper is the traditional way of producing paper by using cotton rags and Agro and is totally wood free and eco-friendly. Uses of handmade paper saves trees and forests and thus conserves the eco-wealth. On the occasion, Shri Rajesh Malik, Special Police Commissioner, Delhi Police, announced that Delhi Police will be procuring Handmade paper file cover and stationary from Khadi Gramodyog Bhavan, New Delhi. This is Delhi Police’s second commitment on World Environment Day 2015! The Bank officials present during the event further assured that henceforth Banks will also support K.G. Bhavan and procure KVI Products, especially the handmade stationary. The exhibits at the Green Stationery Exhibition included carry bags, writing pads, notebooks, Gift Envelopes, Photo frame, Gift packs, etc. The exhibition gave an opportunity to the manufacturers to get vast exposure to the market and acquainted the people about the use of handmade paper which has a very positive impact on environment.